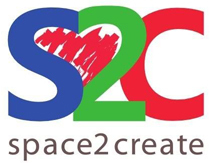 The whole of Space2Create has been creatively focused on preparing our next exhibition. With one month to go till the Green Door Art Trail weekend we are making sure we have as much finished as possible. We have an ambitious plan for four installations and an interactive display that the public can be part of to create an artwork. All the installations will address mental health and stigma. We are also collecting a new selection of pictures from our service users and volunteers for the exhibition to showcase the creative work we do. We were very pleased to welcome some visitors this week too. Cherry Trelogan, a culture policy advisor for Cumbria County Council came to see how we worked with the view to running a session for us. Also Shanon, from Blackwell Arts and Crafts House came to see how we worked and also to discuss an exciting project between Space2Create and Blackwell (Details coming soon). The group continued preparing one of our installations for the Green Door Art Trail in March. The small human figures in a variety of poses will adorn the avenue up to our unit and the wall as well as anything we can attach them to. We have a ttarget to make a minimum of fifty and we have nearly finished 15! On the Kentmere ward, we experimented with collage: using fabric, paper, magazines, letraset and words to create images. One participant used these techniques to create a Birthday card. It is nice when a project can be both directly purposeful as well as therapeutic for the participant. In the session, we continued in preparation for forthcoming exhibitions. We created needle-felted birds, and also continued work on some papier-mache bird figures we had created in previous sessions. Others carried on creating Modroc figures we had also begun before. There were, as always, some wonderful individual pieces being worked on as well. A busy and productive session. A really busy session today! We carried on making the small people modlels from wire, paper and modroc. These are for an insallation to go outside the unit for the Green Door Art Trail at the end of March. It was great to see so many people and the range of figures produced was amazing. We want a whole range of emotions on display and that is what we ended up with. It was also great to welcome Shanon from Lakeland Arts Trust Blackwell House and Cherry Trelogan from the county council who both joined in the session. We have some exciting news about a project with Blackwell to come soon so watch this space. It was great to get our ne exhibition up this week and open, “From a different point of view” showcases photos by our photo group. The pictures have been up a week and are selling as well. We have had some great feedback. We are now looking forward to creating a new exhibition for the Green Door Art Trail. The Green Door Artists Collective kindly invited us to be part of the art trail this year. We are planning to create some large installations in our gallery that show off the talent of our service users but also challenge stigma around mental health. Some great discussion has been going on with far too many ideas to use just for this event but the creative juices have been ignited. On Monday we had the preview of our new exhibition. It was grat to see everyone there and we received a lot of great feedback and support. Chris Hogg, Kendal Deputy Mayor, was impressed and discussed future projects. Cherry Trelogan, Culture Policy Advisor for Cumbria County Council thought the pictures were brilliant. Anne-Marie from the Lakeland Arts Trust, was surprised by how the familiar setting of Blackwell which she knew well was represented in such a different way. The exhibition runs till 25th March. Today was a quiet day over half term. The group continued exploring ideas using paint trails to create chaotic and interesting images. In our Thursday session we continued producing items for forthcoming exhibitions. The birds made from papier-mache started to take shape. We also spent time discussing themes and ideas to develop our plans further, which proved very positive and helpful. Lots of work still to be done, but everyone is very keen and supportive. In WellArt the group began work on an installation for the Green Door Art Trail in which we are involved this year. This will be a collection of small figures in various poses of distress and recovery representing the stigma and struggle with mental health as well as the hope offered by pace2Create as a healing space which all the figures will be heading up the lane to our unit. The figures were made by cutting three lengths of wire. Forming a body with one, arms with the second and legs with the third. These are then wrapped in newspaper to build the body and pose, held together with masking tape before being modroced over the top. We will paint them all bright colours for display on the walls and path outside the unit. I have spent a lot of time recently trying to justify to funders why they should put money into Space2Create. I draw on my own experience both as a mental health patient battling serious depression, suicidal thoughts and schizoid tendencies and as a practitioner observing the effects of creative activity on fellow sufferers. In doing so I arrived at a long list of benefits and reasons, some of which feel contradictory to others. Yet to me the be…nefits are clear. I want to share my thinking and welcome your comments and input as I briefly tackle each desperately, so here we go. I found that at my worst moments being creative was a life saving activity. As a distraction it gives a focus that you control. When most of your life is out of control or being controlled by other people, the act of putting paint to canvas on your terms is a liberating feeling. People often talk about being in the “zone” when they create. This allows all the other stuff, the crap that is screwing your life up, to be temporarily denied. It will need addressing, but you need to escape it, it’s constant presence ripping your soul apart. Art does that. The chance to be, for a time, transported to a creative place of empowerment is so valuable to me. Others I have worked with describe this too. A chance to escape your problems. It doesn’t matter what or even how good it is, just doing it is so powerful. Next time no. 2 Cathartic creativity. Photography fun and some random splatting! This week has seen a focus on photography. First of all we have been preparing to hang a new exhibition of photographs “From A Different Point Of View”, the preview on Monday 16th February 4pm to 7pm. Then we arranged to take the Photo Group into a new undeveloped part of the Factory complex where we have our unit. These old buildings were pretty derelict but it was certainly a great opportunity to get some unusual shots. The WellArt and 2Create groups produced some great artwork using nothing but scribbles and paint splats while the Thursday Group were looking ahead to the Green Door Art Trail exhibition in March, planning two installations for that. In this session we challenged the group to draw with out drawing! Rather than drawing an object or image we attempted to use random lines to make up the image. We carried on the random theme by adding colour in a random way by splatting watercolours then blowing them with a straw to produce interesting arrangements. In the session on the ward, we experimented with different letter, shape and font arrangements; by putting them together we created some very pleasing images. This session also allowed for much discussion and idea sharing – participants were very supportive and encouraging to each other whilst creating their images. The photo group went into a new part of The Factory waiting to be developed. Inside was very cold and very run down. It was a really interesting place to take pictures. With ten of us there we will have lots to look through. Here is a quick selection of unedited images. We are planning to edit them into black and white and give it a really dark moody feel. These need a lot of work to get them useable! In this session, we worked with papier-mache to create birds. This technique is simple, but allows you to build up a figure with layers of wet, glued paper until you have the desired shape. We plan to display the resulting work in an exhibition later on. Two participants also worked on creating a withy lantern. This was so successful we are planning a few sessions to create a lantern installation! Others in the group worked on their own items; drawing and creating. A typical, busy Thursday session: unique, individual and highly creative. The WellArt Group had a go at the techinques the 2Create Group were using earlier in the week. Trying to create images without actually drawing them but using random lines to form them. Then applying blobs of water colour paint which were then blown with a straw. This once again produced some really interesting and effective pictures. It has been a busy week at S2C. Each session this week was led by a volunteer showing the talent there is among our volunteers as well as showing how we are prepared to help individuals develop and grow their skills. On Tuesday we held our AGM which celebrated a year of big changes for us. Our move into Unit 31 at the Factory giving us the space and venue to provide a much better quality of service to our service users. We also became a registered charity which will help the trustees in their work to grow and develop the organisation. The meeting also saw Jane Payne elected to the trustees. On Wednesday we held our first Management Committee meeting. The committee is made up of trustees, volunteers and service users and looks after the day to day running of Unit 31. From cleaning to session planning, exhibitions to fundraising, the committee provides a truly service user led approach allowing all involved to have their say and contribute. In the session we looked at Louis Wain, an English artist best known for his drawings of large-eyed cats. In his later years he was believed to have suffered from schizophrenia, which may have altered the way he drew. He continued to draw cats, but they were heavily disguised and embellished, often using patterns. We used his influence to start drawing an animal, bird, fish or person, and then looked at features we wanted to bring out with the use of patterns and colours. This proved to be an experimental but really positive session, with everyone producing truly unique pieces. On the ward we created some tag books using altered postcards and previously generated artwork. We cut the base image to standard luggage-tag size using a template, then used images and text found in magazines (or added by hand) to decorate each tag. Having punched a hole (with decorative surround) in each, we then strung the tags together using a ring to create books with some very surreal, funny or thought-provoking motifs. These simple techniques lent a very relaxed and chatty feel to the session, which was nevertheless very creative in its outcomes. In the session this Thursday we looked at button art, and used buttons to create some 3D images. From a simple heart to a detailed motorbike, participants chose to build up images which were personal to them. Others in the session sewed and drew. A typical Thursday session: lots of individual work was created. The group looked at the artist Bridget Riley, a leading op artist. Op art is visual art using optical illusions. The group were then show some techniques for creating op art, then created their own work using a medium of their choice.